1869, 15¢ brown & blue, type II, segmented cork cancel, rich colors, Very Fine; with 2004 P.S.E. certificate. 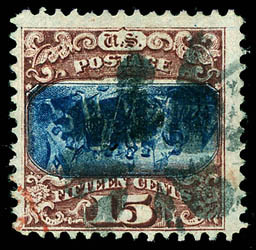 1869, 15¢ brown & blue, type II, red cancel, Very Fine and attractive. 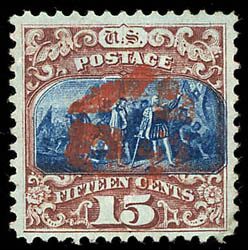 1869, 15¢ brown & blue, type II, center inverted, black cork and small portion of red transit cancels, rich bright colors, centered low with design clear of perforations all around, Fine and attractive, this being one of two examples to receive this grade with none higher, Scott catalog value for fine centered examples with only minimal faults; with1995 P.F. and 2015 P.S.E. certificates, the latter Graded (F 70, SMQ $90,000). 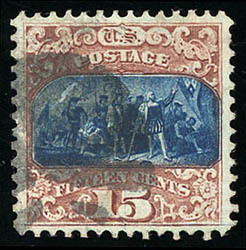 AN EXTRAORDINARILY RARE SOUND USED EXAMPLE OF THE 1869 15¢ PICTORIAL WITH CENTER INVERTED. 1869, 24¢ green & violet, light quartered cork and small portion of red transit cancels, perfect centering of design within large beautifully balanced margins, rich vibrant colors in bright paper, a Superb gem, one of two examples to receive this grade with only one higher (98J); with 2016 P.S.E. Graded certificate (Superb 98, SMQ $14,250). 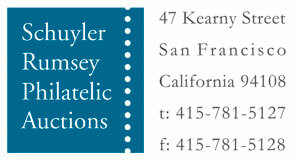 WITHOUT QUESTION OF OF THE FINEST USED EXAMPLES OF THE 1869 24¢ PICTORIAL ISSUES IN EXISTENCE. 1869, 24¢ green & violet, well centered, contrasting red cancel., fresh and Extremely Fine, ex-Saadi, Koppersmith; with 1990 P.F. certificate. 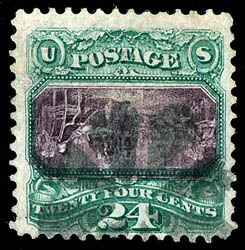 1869, 24¢ green & violet, without grill, large part o.g., rich deep colors, light vertical crease at right, Fine appearance, the are about two dozen examples of this variety known with about half having flaws; with 1973 & 2013 P.F. certificates. 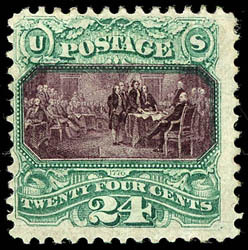 AN EXTREMELY RARE EXAMPLE OF THE 24¢ PICTORIAL ISSUE WITHOUT GRILL. 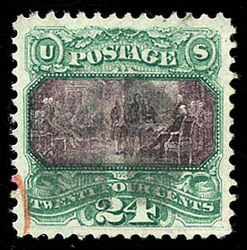 1869, 24¢ green & violet, center inverted, neat circle of wedges cancel, rich vibrant colors and crisp detailed impressions on bright paper, attractively centered especially for the issue with perfs well clear of the design all around, F.-V.F., the only example to receive this grade width none higher, Scott value for fine centering and with minimal faults, ex-Drucker; with 1987 and 2015 P.F., 2011 P.S.A.G. & 2011 P.S.E. certificates, the latter two Graded (F-VF 75, SMQ $92,500). 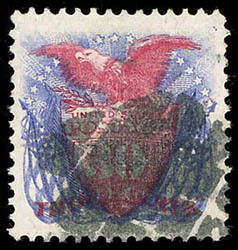 AN EXTREMELY RARE SOUND EXAMPLE OF THE 1869 24¢ PICTORIAL ISSUE WITH INVERTED CENTER. 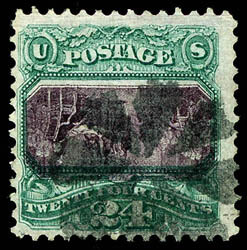 1869, 24¢ green & violet, center inverted, light unobtrusive fancy rosette cancel, rich colors, bright and fresh, small sealed tear at upper left, otherwise F.-V.F., Scott value for fine centering and with minimal faults; with 2010 P.F. certificate. 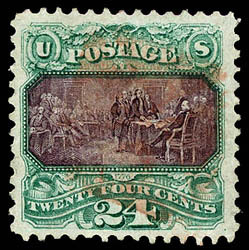 AN ATTRACTIVE LIGHT CANCELED EXAMPLE OF THE 1869 24¢ PICTORIAL ISSUE WITH INVERTED CENTER. 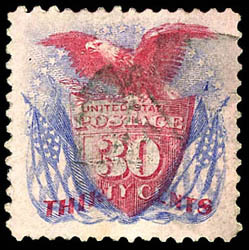 1869, 30¢ ultramarine & carmine, well centered within huge margins, bright colors and paper, circular grid cancel, Extremely Fine and choice. 1869, 30¢ ultramarine & carmine, light cork cancel, strong colors, large well balanced margins, Very Fine; with 2014 P.F. Graded certificate (VF 80).